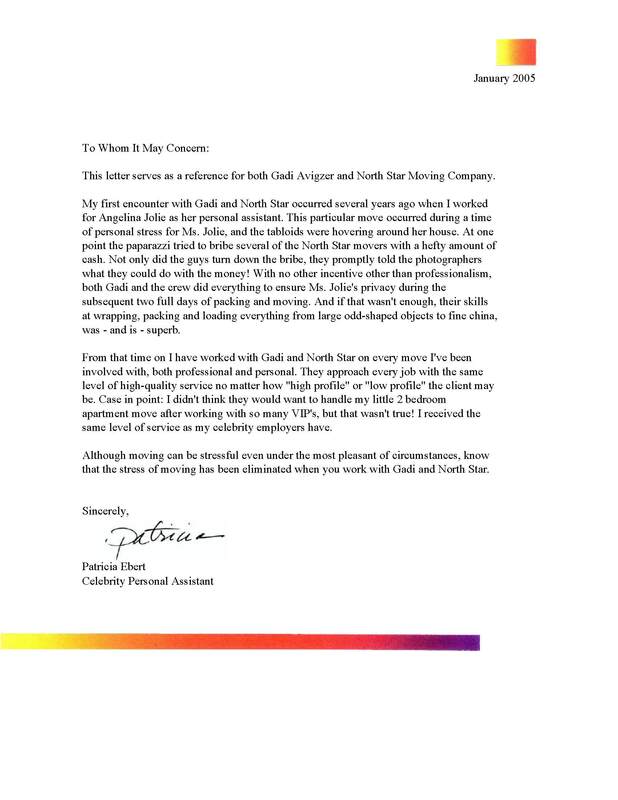 This letter serves as a reference for both Gadi Avigzer and North Star Moving Company. My first encounter with Gadi and North Star occurred several years ago when I worked for Angelina Jolie as her personal assistant. This particular move occurred during a time of personal stress for Ms. Jolie, and the tabloids were hovering around her house. At one point the paparazzi tried to bribe several of the North Star movers with a hefty amount of cash. Not only did the guys turn down the bribe, they promptly told the photographers what they could do with the money! With no other incentive other than professionalism, both Gadi and the crew did everything to ensure Ms. Jolie’s privacy during the subsequent two full days of packing and moving. And if that wasn’t enough, their skills at wrapping, packing and loading everything from large odd-shaped objects to fine china, was – and is – superb. From that time on I have worked with Gadi and North Star on every move I’ve been involved with, both professional and personal. They approach every job with the same level of high-quality service no matter how “high profile” or “low profile” the client may be. Case in point: I didn’t think they would want to handle my little 2 bedroom apartment move after working with so many VIP’s, but that wasn’t true! I received the same level of service as my celebrity employers have. Although moving can be stressful even under the most pleasant of circumstances, know that the stress of moving has been eliminated when you work with Gadi and North Star.